My Adobe decided it should be version X now, and it misbehaves in so many ways. One way is that it is impossible to get it to open a pdf document from within TexnicCenter (or I missed something...) Pressing F5 opens up the Adobe with some start menu asking me to open a recent file blablabla. But not the file I want to see. And TexnicCenter tells me the command could not be executed. C:\Programme\SumatraPDF\SumatraPDF.exe -inverse-search "\"C:\Programme\TeXnicCenter\TEXCNTR.EXE\" /ddecmd \"[goto('%f','%l')]'\""
You can also find tutorials for using TXC with Sumatra at TeXnicCenter Tutorials. It is recommended to use the -reuse-instance in the calling line to be configured inside texniccenter. You may also want to take a look at the latest texmaker, as it comes with its on PDF viewer. 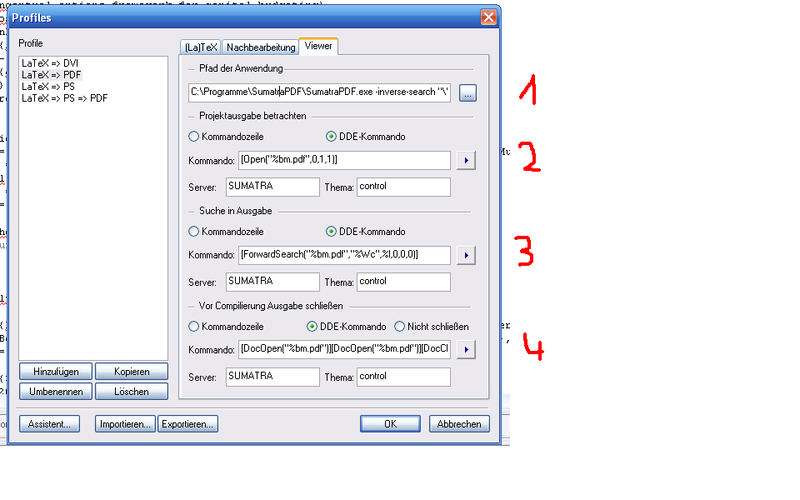 I want to mention that by installing SumatraPDF first and then TeXnicCenter, the steps form the tutorial are automized. It takes you something like 5 minutes to get a fresh installation of MiKTeX, SumatraPDF and TeXnicCenter, while getting inverse-search etc. Don't forget to choose "LaTeX=>PDF". However, most PDF readers (including Adobe) can be used by changing from DDE Command to Command Line argument and using “%bm.pdf” with a leading space in the box. That’s for View project’s output and for Forward Search. For many readers you have to use Do not close in the last option which means you have to close the pdf manually before recompiling. However, for viewers such as PDF-XChange Viewer you can put /close “%bm.pdf” in the bottom box and the document will automatically close. Actually, the answers from Martyn and Adam Nellis solved this problem. Thanks a lot, folks. I am just putting it step by step, so someone else can use it. Adobe Reader X: In Adobe Reader X, go to Edit->Preferences->General and uncheck Enable Protected Mode at startup. If you are using MiKTeX version 2.9 you have to use %tm instead of %bm. Not the answer you're looking for? Browse other questions tagged installing viewers texniccenter or ask your own question. LaTeX viewer and forward search: how to achieve?